Carrier oils are vegetable based oils that are derived from the fats of the vegetable. They are usually made from the seeds or nuts. Many carrier oils are used for making blends for a variety of different uses. They are used in many cosmetics, lotions, essential oil blends, and more. Essential oils evaporate quickly and may also cause skin irritation when applied directly to the skin which makes using a carrier oil beneficial. Many carrier oils have a limited shelf life as well and will go rancid after a certain period of time. Here is a list of some of the most common carrier oils and their traits as well as their usefulness. Grapeseed oil – Made from the seeds of grapes, it is high in linoleic acid and vitamin E. Grapeseed oil is a good moisturizer and is a light non-greasy oil that wont clog pores and is a mild astringent. This makes it a good oil to use on the face as well as for people prone to acne. It is good to use on the face to help fight wrinkles and aging skin. It can also be used on the scalp and hair. It does have a shorter shelf life than other oils. Jojoba oil – Pronounced “ho ho ba”, it is actually more chemically closer to a liquid wax than to an oil. It is extracted from the seeds of the jojoba plant and is also non-greasy and absorbs quickly into the skin and hair. It does have a longer shelf life compared to some of the other oils and won’t turn rancid. This oil is a non-toxic and non-allergenic oil that is very similar to the human sebum. Sebum is what helps protect the hair and skin from drying out. Not only is this great oil high in vitamin E, but it also has antibacterial properties and is an antioxidant. It is great for use as an oil treatment on the hair and scalp. It helps undernourished hair follicles and dried or frizzy hair. It is an excellent skin moisturizer as well. Fractionated Coconut Oil – This oil is a fraction of coconut oil and has components of regular coconut oil removed. This allows for a long shelf life and for the oil to remain a liquid. It is very lightweight, non-aromatic, and non-greasy as well. It helps aid in the absorption of other essential oils into the skin and helps against sensitivity and skin irritation. This type of coconut oil has had most of the lauric acid removed from it. Lauric acid is what gives whole coconut oil its antibacterial properties. This oil is also excellent to use in skincare and on the hair. This is probably the most used carrier oil for massages. Coconut Oil – 100% coconut oil is usually cold pressed and is solid at room temperature. This oil contains all the antibacterial properties of lauric acid. This has the slight coconut aroma most are used to. This oil does leave a greasy feeling on the skin. 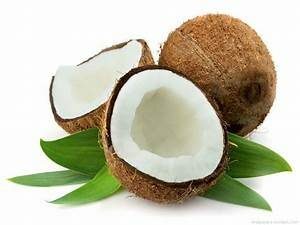 Coconut oil is sometimes applied to the skin as a moisturizer and some people use it to reduce and aid with flareups caused by eczema and a skin condition called psoriasis. Coconut oil is also used in hair products to help promote healthier hair. Many people also use this oil for oil pulling (swishing the oil in the mouth to pull out bacteria). Sweet Almond Oil – This is also one of the best oils to use for hair and skin care. It is a derived from almonds so anyone with a nut allergy should beware. Almond oil is a great base for lotions and creams and may leave a slight oily residue. It is an ideal oil known for the ability to moisturize and nourish. Great for all skin types. When taken internally it has many health benefits. Olive oil – Olive oil is much thicker and greasy with a slight aroma. Therefor it isn’t usually the carrier oil of choice in most applications. It has a shorter shelf life than other oils. It also has more uses from a culinary perspective since it is good for fusing herbs. Shea Butter – This is a fatty substance and is used in many skin care products. It is thick and solid at room temperature. Raw shea butter is rich in stearic, oleic acids, and benefit-rich vitamin E and vitamin A. It is an excellent moisturizer and may reduce skin inflammation. It is also used to help reduce wrinkles and skin aging. It is also used in lip balms. Cocoa Butter – This is also solid at room temperature. It is high in fatty acids and is good for hydrating the skin. It also has anti-oxidant and anti-inflammatory properties. This makes it very useful in skincare and cosmetics. Some people use it on scars and stretchmarks. It is also used in lip balms. There are many other carrier oils such as sunflower, apricot, avocado, argan, and more. Each of which of their own pros and cons.